Bitcoin is gaining ground while its main rivals are lagging behind. There are good reasons, internal and external, driving the dominance. Market capitalization nears 50% and may continue rising. The BTC/USD not only escaped from the abyss but also rallied to higher ground and then enjoyed a healthy consolidation. Its top rivals, Ethereum and Ripple also seemed to have been on the rise, but the momentum was lost quite quickly. In our technical analysis, we note that Bitcoin is well supported and enjoys a bullish bias while the others are between either stuck or in a precarious state. 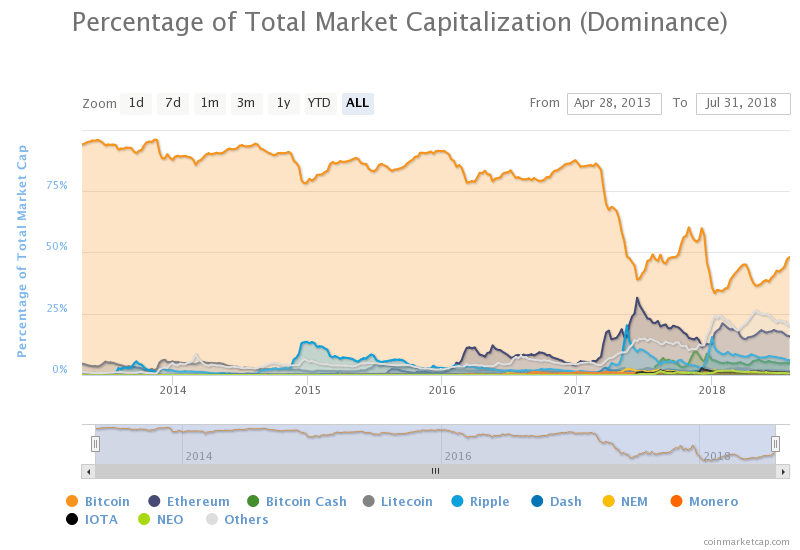 The recent price action pushed Bitcoin's dominance to around 48%, the highest this year and the trend does not seem to wane out. There are five main reasons for this disparity and it seems likely that the trend will only continue. The crypto-sphere is packed with news and speculation about an upcoming Bitcoin ETF. So far, a request by the Winklevoss brothers has been rejected but others await hearing in September. An ETF will open trading in the digital coin to retail investors and may send prices higher. The focus of these ETF's is on Bitcoin and that explains the disparity. But this institutional focus on Bitcoin is not new. BTC/USD futures were introduced already in 2017 by the CBOE and the CME. It already helped the veteran crypto coin to mature. Other financial big boys have also shown interest after shunning Bitcoin in the past. The long list includes JP Morgan, Goldman Sachs, and Blackrock, a behemoth. All in all, the biggest crypto is getting bigger thanks to the big boys. "There is no such thing as bad publicity" goes the old saying. Although it is not 100% true for Bitcoin, it seems that both positive stories about adoption and negative headlines like the criminal use of the asset to launder money maintain the high levels of interest in the granddaddy of cryptocurrencies. The media also highlights comments from policymakers on the topic. The consensus view among central bankers is that the blockchain technology is useful but the cryptocurrencies are irrelevant. Some not-so-savvy listeners conflate blockchain with Bitcoin.and may get the feeling that the relatively lax approach is a de-facto endorsement. Despite the crash in prices in early 2018, there is still a lot of media interest and the spoils go to the largest crypto. The surge in crypto prices in 2017 brought every type of trader and speculator to trading digital coins. After prices plummeted and the dust settled, many speculators lost interest but more educated traders were still intrigued. Why? Volatility is low in other asset classes and cryptos continued offering enhanced action. Yet while wild moves are fascinating, a bit of logic is necessary as well. As the granddaddy of cryptocurrencies, Bitcoin offers the longest history of price action offered for analysis. But it is not only the distant past but also the recent one. The higher trading volumes and the institutional interest mentioned earlier mean that movements in prices have become somewhat more predictable. Lines of support and resistance, trendlines, and other indicators tend to work better in this environment. The notion of better predictability in BTC/USD trading draws more interest from serious traders and consequently higher prices. It is time to look at the competition. Ethereum offers an exciting alternative to Bitcoin and is the basis for most Initial Coin Offerings (ICO's). However, Ethereum still has its own issues. Scaling, which dogged Bitcoin at some point, is now weighing on Ethereum as well. There have been many ideas and roadmaps for scaling but some promises have never materialized and pessimism is growing. Crypto hedge funds cite scaling issues as the reason for shorting the second digital coin in terms of market capitalization. This is in stark contrast to the interest in Bitcoin. Ripple has a very useful technology adopted by banks, especially in Asia. The growing usage sparked a massive rally in December 2017 that placed Ripple as the second cryptocurrency after Bitcoin. The hegemony of Bitcoin seemed to be in danger and there whispers about the upcoming "flippening", a dethroning of Bitcoin by Ripple. However, there is a big disconnect between the truly efficient technology and XRP. The technology in use is Ripple Connect which uses the InterLedge Protocol (IKP). XRP is a separate product that features fast transactions and high liquidity but is not in broad use. As time passed by, this simple fact dawned on many investors and XRP/USD never recovered. If the company ties the two together in some manner, XRP could be worth quite a bit. However, there are no movements in that direction. All in all, there are good reasons to see Bitcoin beating the competition. An approval of an ETF could lift all boats, but Bitcoin's boat is bigger.